DETROIT (Bloomberg) -- Visteon Corp., the supplier shopping two of its four units, took another step toward remaking itself today as shareholders elected nominees who support revamping the company. Shareholders voted today to re-elect directors Duncan Cocroft, Kevin Dowd, Jeffrey D. Jones, Tim Leuliette, CEO Don Stebbins and Harry J. Wilson and to add Robert Manzo, a consultant to troubled companies nominated by a "significant shareholder," according to a proxy statement. The company said in April that four directors would not stand for re-election, giving control to directors pushing a makeover. The voting results were disclosed by Jim Fisher, a company spokesman, in a telephone interview. Visteon, which left bankruptcy in 2010, has been shedding lower-margin revenue in interiors and lighting to focus on faster-growing operations in Asia. Stebbins hired Goldman Sachs Group Inc. and Rothschild for advice for a strategic review, the company said Oct. 17. Independent board members such as Wilson and Leuliette pressed Stebbins to interview banks to help streamline the supplier, two people familiar with the process said in October. The company reported a first-quarter net loss of $29 million, its second consecutive quarterly deficit after four straight profitable quarters. Visteon has been plagued by losses since it was spun off in 2000 by Ford Motor Co. The supplier has expanded business with automakers other than Ford and narrowed its product offerings. "When the market thinks about focused growth stories, Visteon isn't top of mind," Matthew Stover, an analyst at Guggenheim Securities LLC, said in an interview before the shareholders meeting. 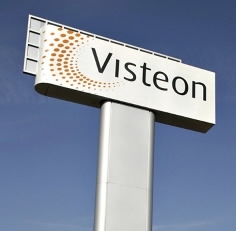 Visteon shares have dropped 22 percent this year through yesterday after falling 33 percent in 2011. Visteon began simplifying its corporate structure in November when it signed a nonbinding agreement to sell most of its interiors unit to Yanfeng Visteon, the Chinese joint venture with SAIC Motor Corp. The company agreed to sell its lighting unit to Varroc Group of India in March for $92 million. The unit, which supplies automotive exterior lights, had revenue of $531 million last year. Visteon Oct. 31 sold a part of its stake in Duckyang Industry Co., an interiors joint venture, and it no longer had a controlling interest. Visteon also plans to buy the remaining 30 percent of Halla Climate Control Corp., a publicly traded Daejeon, South Korea-based maker of vehicle air conditioners and heaters, five people familiar with the plans said in October. The company's market capitalization, $2.03 billion as of yesterday, has been less than the value of its stakes in Halla and Shanghai-based Yanfeng Visteon Automotive Trim Systems Co., the venture with SAIC, according to data compiled by Bloomberg. Visteon now has about 40 percent of the revenue it had in 2000, when it spun off from Ford. Originally dependent on the North American market, in 2011 Visteon got 42 percent of its sales from Asia and 36 percent from Europe. It counts Hyundai Motor Co., based in Seoul, among its biggest customers.